A muffled sound resembling a groan in a storm can be heard close to it. A gigantic blue sphere is floating high up in the sky over Polar Peak. 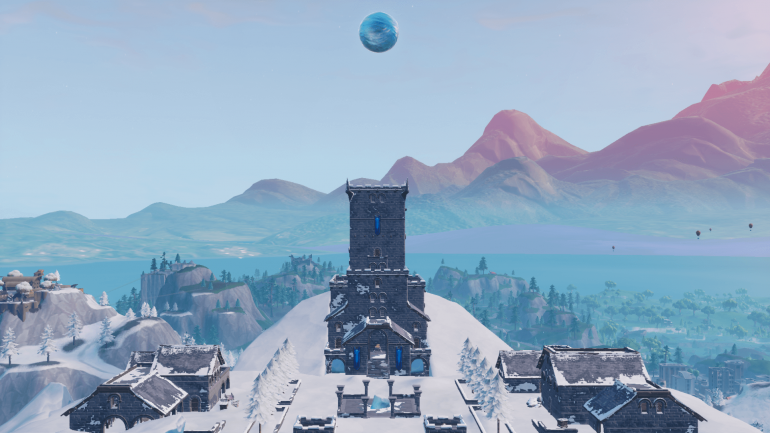 The sphere appeared today after the Fortnite: Battle Royale servers went back up following the v7.20 update. It emanates a beam of light downward, to an ice block that is where the old Infinity Blade used to be in Polar Peak. When approaching the sphere, players can hear a sound that resembles a groan mixed with the sound of a storm. These two sounds are muffled by the sphere, and whatever is causing them seems to be trapped or locked inside it. Going through the sphere causes the player’s screen to freeze and be crystalized, as shown in the GIF below that we made during a Playground match. Along with the sphere, more ice has melted under the castle in Polar Peak. Some cells are now accessible in its underground, but there are still several areas covered in huge ice blocks that don’t seem to be ready to melt. The sounds coming from the sphere and the ice melting under the Ice Castle might mean that the dragon eggs leak is real. In the beginning of season seven, some dataminers found there were eggs with dragon-shaped figures inside them, and started speculating that these creatures could make an appearance in the world of Fortnite: Battle Royale. At this point, this is the only concrete clue we have to what this giant water or ice sphere might mean to the game. As we’re approaching week seven, this sphere will surely unfold in other events that will lead us to the grand season finale around Feb. 28. What will happen then is anyone’s guess.